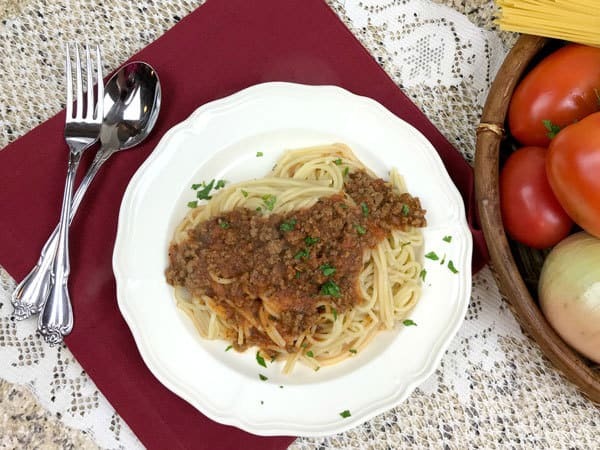 One of our favourite easy family meals to make is pasta with a tomato meat sauce. 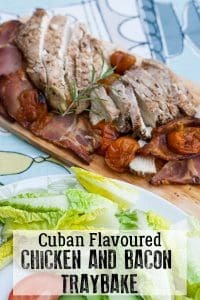 It’s quick and easy and tastes richer and more flavoursome than from a jar. 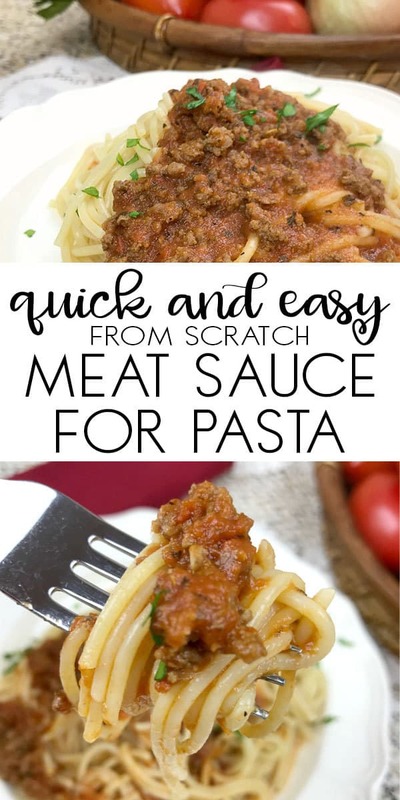 PLUS… it only takes 30 minutes max to make and everyone in the family loves it. 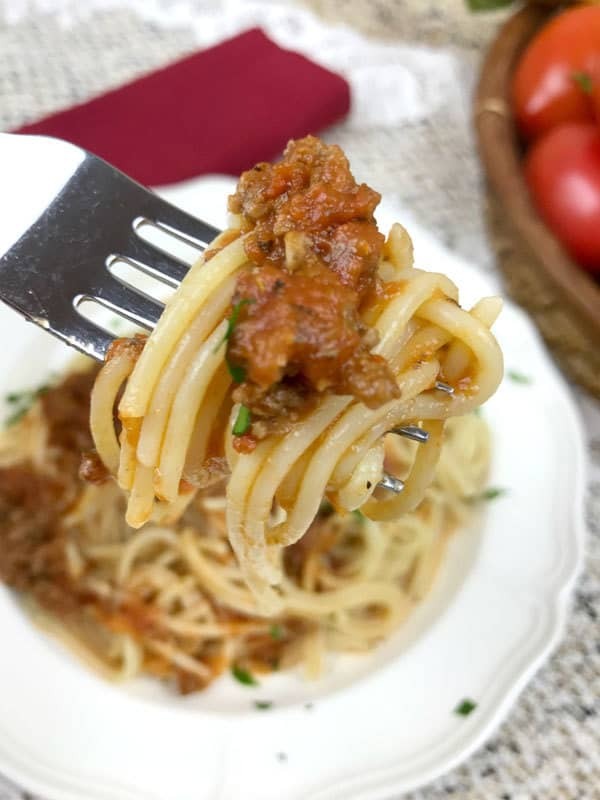 I like to sprinkle some parmesan cheese on the top of this easy Bolognese Sauce just before serving and serve it with some homemade garlic tear and share bread. 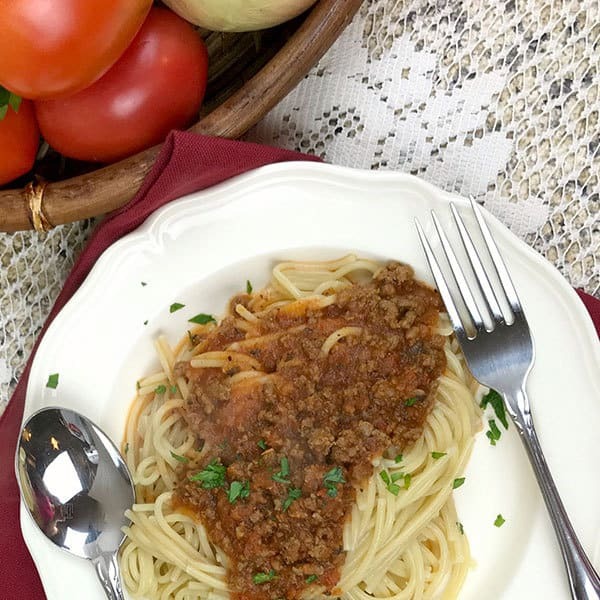 Although this isn’t a traditional Spaghetti Bolognese sauce as we are missing the vegetables it does make a quick mid-week alternative and my kids now frequently call it Spag Bol instead of meat sauce. 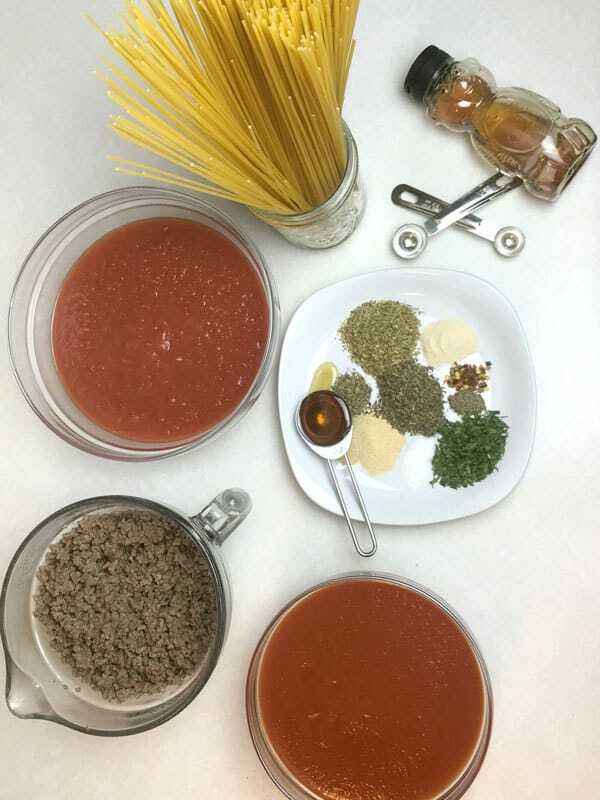 With very little ones in the family (or messy husbands) you may want to swap the spaghetti for a less messy pasta alternative. 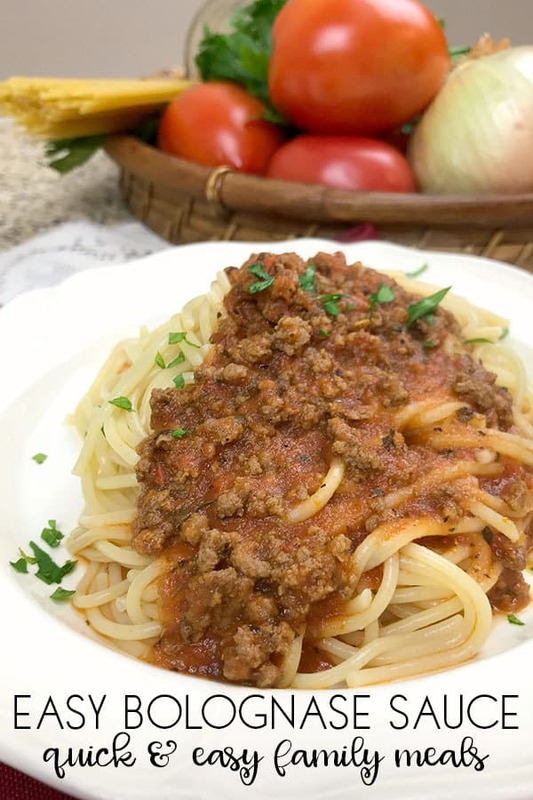 We have included affiliate links to the ingredients and tools that we used to create this recipe. We discovered quickly how much money we could save by cooking from scratch. 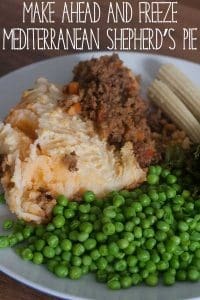 We buy our tins and spices in bulk and then get mince from the butchers and freeze any left over. 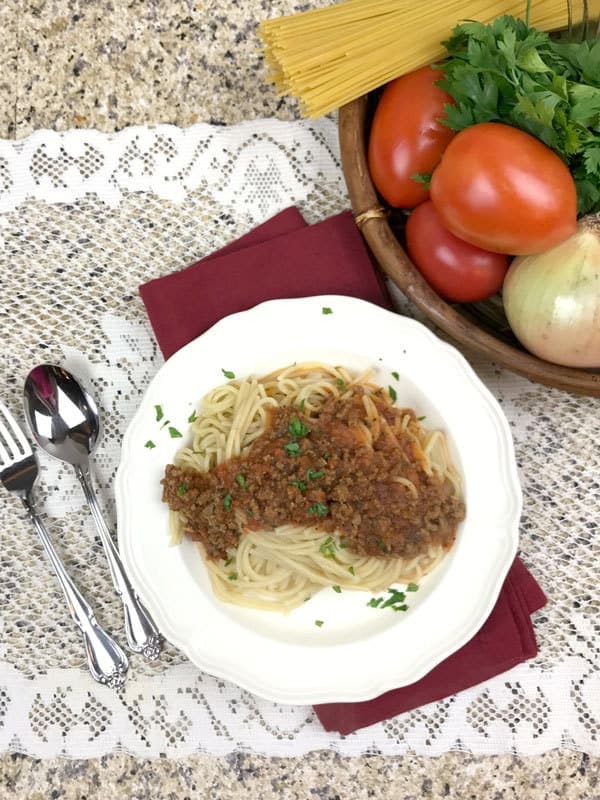 This recipe will make enough for our family of 4 to have 2 – 3 meals depending on whether we serve with a large side salad and reduce the pasta and meat sauce that we use. 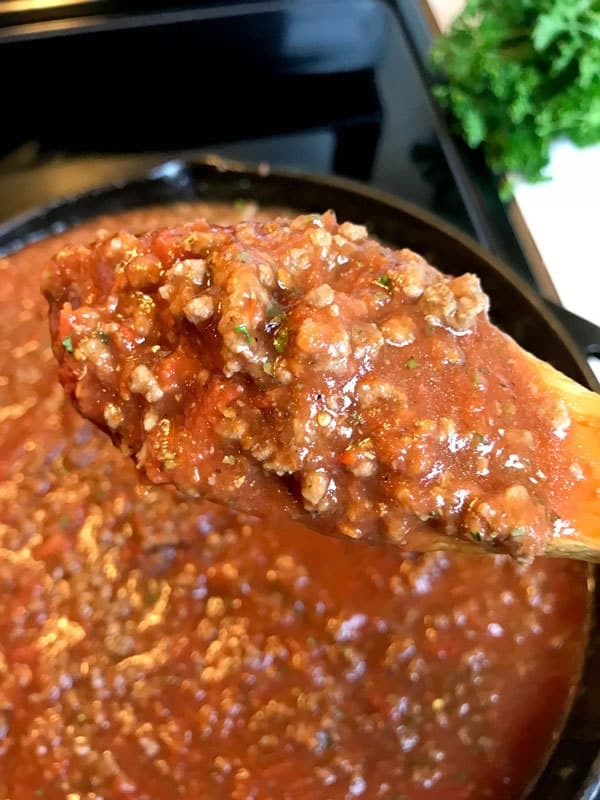 Whilst this simmers on the stove around 10 to 15 minutes into cooking and get the garlic bread into the oven at the start and it will be ready all at the same time. 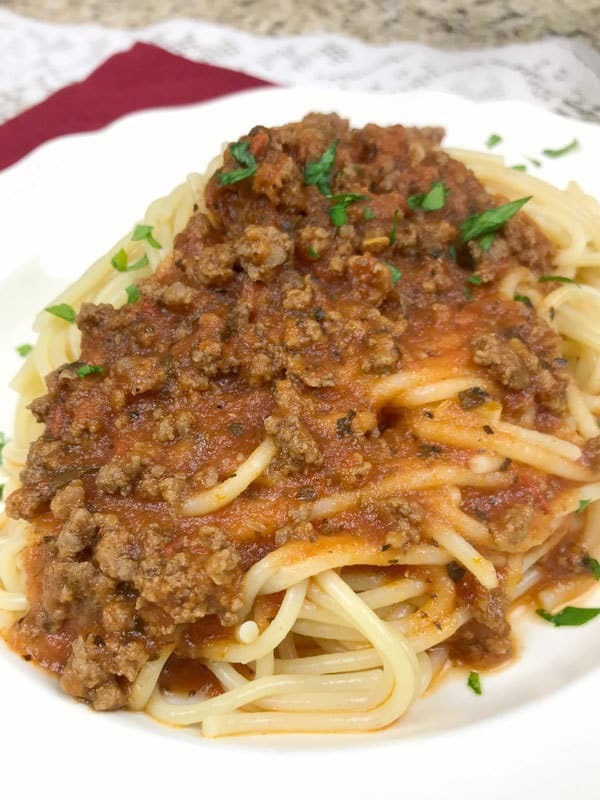 As a bonus, you can make this meat sauce in advance (say at the weekend)! Then Freeze in portion containers, I really like using these Pyrex Dishes with a lid for freezing food and then defrost in the middle of the week when you need it and it will take just the time it takes to cook some pasta. Ideal for busy weeknights with clubs and after-school activities. 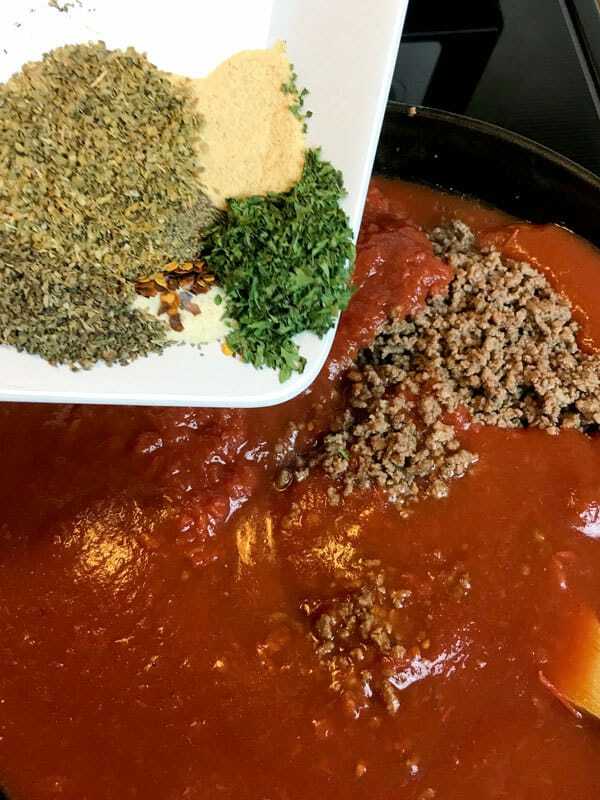 Quick and easy make-ahead meat sauce for pasta. Rich in tomato flavours and perfect for mid-week family meals. 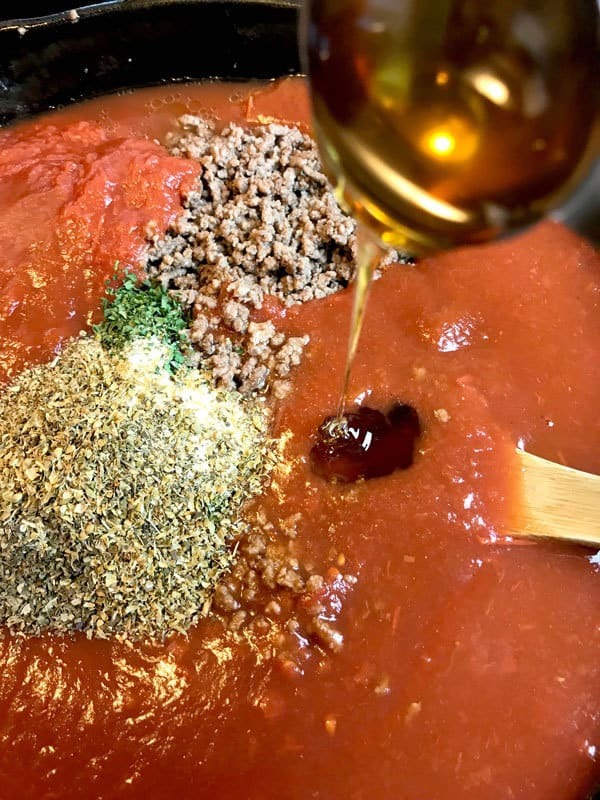 Make at the weekend, freeze this bolognese sauce and defrost as needed. 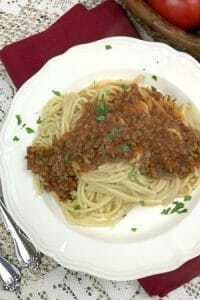 In a large pan combine browned ground beef, tomatoes, tomato sauce, water, seasonings, and honey. Cook over medium heat for 20 to 30 minutes, stirring occasionally. 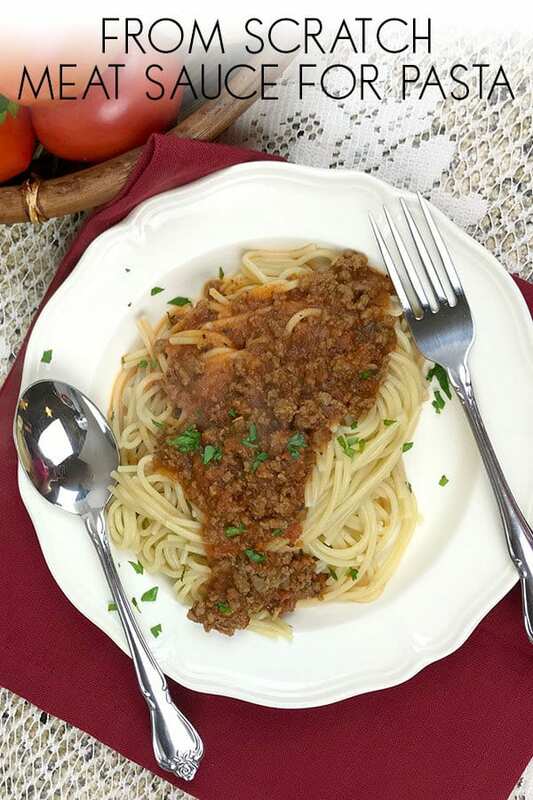 Serve over pasta. Prepare as normal then divide into portions in freezable containers. Allow to cool thoroughly. Then place in the freezer. 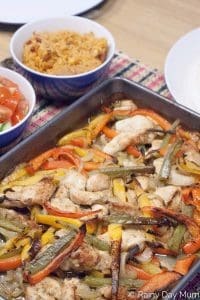 Take out 24hrs before use and defrost in the fridge and then reheat in a pan on the stove before serving. As one of our favourite family recipes the equipment we use is part of our essential kitchen equipment. Before moving we had a small house, so things that could do double duty were great as they saved storage space. 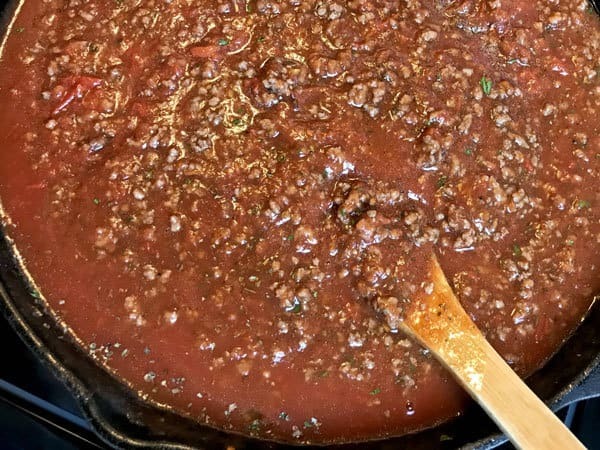 This pan and skillet cast iron set does just that. 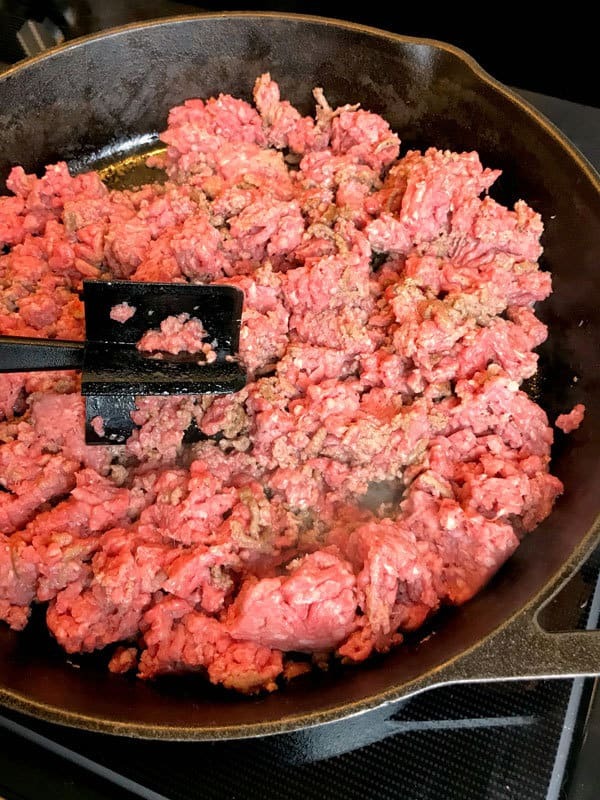 The cast iron skillet doubles up as the pan lid. And as it goes straight from hob to the oven it’s perfect for cooking dishes that need to do both! I know it is technically a pastry board, but I’ve been using mine as a chopping board as well as a surface protector by the oven in our home. This marble pastry board stays cool, doesn’t mark when you chop on it and looks gorgeous as well. Yes, it’s more expensive than a wooden or a plastic board but… with those I have had to replace as they deteriorate over time. This is not going to do that, my mum had one for years and she only replaced as it as it was knocked off the surface and broke after 20 years!